Salmonella food poisoning is also called salmonellosis, and is a severe but self-limiting infection of the digestive system. Most outbreaks of food poisoning are caused by Salmonella typhimurium and Salmonella enteritidis. 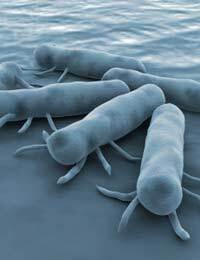 Another species of Salmonella, S. typhi, is the causal agent of typhoid fever, a much more serious food-borne illness. Salmonellosis develops after eating foods contaminated with Salmonella bacteria. Culprits include eggs (poultry is a carrier of the bacteria), minced meat and chicken, dairy products, cream-containing deserts, sandwich fillings and processed foods generally. The bacteria are killed quickly by heating to a temperature that exceeds 66 degrees Celsius, and the cells cannot divide below 4 degrees Celsius. Most cases of food contamination are therefore caused by inadequate storage of cooked food, or cross-contamination from raw foods. The symptoms that develop within 12-36 hours of eating food containing Salmonella bacteria are the typical ones: nausea with vomiting, abdominal cramps and diarrhoea, which can be severe. The affected person also experiences chills and sweating and feels very tired and ill with, of course, no appetite. Not eating for a day or so does no harm while the symptoms subside but the real danger is that of dehydration. Someone with Salmonellosis is unable to drink even plain water without vomiting, and the very young and the very elderly are at high risk of losing more water than they can take in. When dehydration sets in, the body can go into shock and the food poisoning episode can be fatal. Salmonella is probably less of a risk in the UK now because of the furore a few years ago about the bacteria being found in chickens and eggs. The campaign for Salmonella-free eggs was made famous by the politician Edwina Curry. Eggs and poultry today are checked regularly to make sure they do not contain large amounts of Salmonella. To be cautious, however, it is still recommended that eggs are scalded in boiling water for 5 seconds before they are cracked open for cooking since, if Salmonella is present, it is almost always on the shell. There are some cases of Salmonellosis each year that cannot strictly be classed as food poisoning because they are contracted directly from animal sources. Pet lizards, terrapins, turtles and rodents can all carry Salmonella bacteria but are not actually ill as a result. Touching pets or pet faeces and then not washing the hands properly before cooking or eating can introduce enough bacteria to set up an infection that leads to a digestive upset. Most people recover naturally from salmonellosis. Although the illness is not pleasant, it is usually not life threatening and does not need therapy with antibiotics. Exceptions to this general rule are cases that occur in the very old or in young children, who can become very ill because of dehydration. It is also a good idea to report an episode of severe food poisoning to a local GP because they submit all positively identified cases to a database. It is then possible to see if an illness is just an isolated case, or part of a larger outbreak that warrants a full investigation.